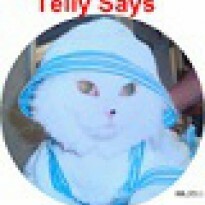 Article first published as Book Review: Mafia: The Glamour of Crime by Fein Meynendonckx on Blogcritics. I don't know where to start with my review of Fein Meynendonckx' remarkable book. Mafia: The Glamour of Crime is a coffee table book to be sure. It is an oversize book filled with absolutely amazing photographs that take us through the history of organized crime starting in 1910 and bringing us all the way through to today. It is filled with quotations that we all are familiar with, "Leave the gun, take the cannoli" and some not so familiar, but every one is interesting. The text is in English, German, and French which is another thing that I found unique for a book like this. I fell in love with the cover as soon as I saw it — it actually has fake bullet holes in it. At least I hope they are fake! There is even a bookmark ribbon to keep the page of your favorite place. Mine is on James Cagney. My favorite feature of Mafia is, of course, the photographs. Some are pictures of the actual gangsters, dead and alive, and others are taken from the movies. There are detailed chapters on the biggest gangster actors, chapters on Gangster Talk, Gangster Stereotypes, The Mafia in the World, and more. You can find just about anything that you are looking for and more in this wonderful book. Growing up in Philadelphia with an Italian heritage and spending a lot of time in South Philly, this book was like a visit home for me in many ways. There is no doubt that Meynendonckx did his research and put his heart and soul into this amazing book. I spent hours just looking at the pictures over and over. 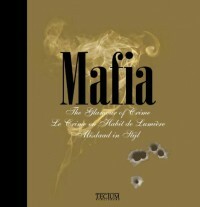 Anyone with an interest in organized crime needs to have Mafia on their coffee table. It certainly has a permanent home on mine and am proud to display it.